There are several non-negotiable traditions in our family, and chief among them are Sunday morning waffles with maple syrup. Nothing else, nothing more, nothing less. Waffles and maple syrup. Ever has it been, ever shall it be. I fiddled around with a variety of recipes when we started out on this weekend ritual. I wanted to replicate Belgian waffles, but the whole thing was too involved for lazy Sunday mornings … yeast, stiffly beaten egg whites … just too much faff. I wanted/needed a recipe that could be knocked together in minutes almost robotically, with nothing to actually think about. This is that recipe. It’s an understated thing, hidden at a dark corner of the BBC’s food website, self deprecatingly titled ‘awfully good waffles’. It really is very good. Reliable, simple, forgiving and very quick. You’ll need a big bowl and a whisk. 250g of plain flour go straight into the bowl, followed by a couple of eggs, 5g of salt, 8g of baking powder, 20g of caster sugar, and 30ml of vegetable oil. Slowly whisk in 450ml of milk, until the mixture is smooth and silky. 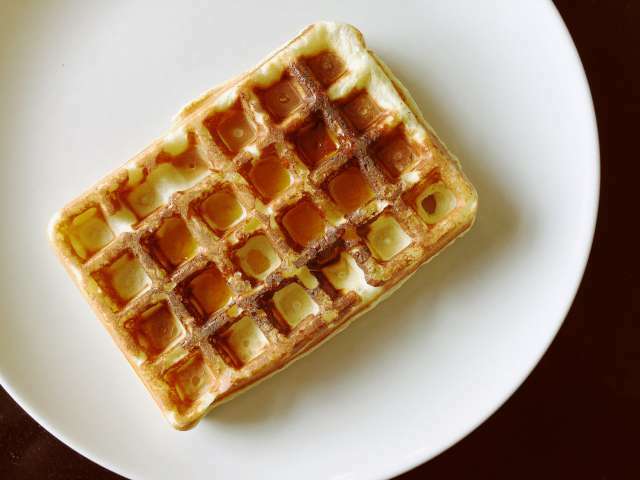 The best – the only – way to cook these waffles is with an electric waffle iron. Stove top irons are hard to use and make a mess. It’s best to invest the sub-£20 that an electric waffle iron would cost and do the job properly. Just under one ladle-full of mixture equals one waffle, and you should get eight or so waffles from this recipe, which is about enough for two of my hungry kids or perhaps three normal people. Sounds delicious, and makes me consider going out to by a cheapo waffle iron.